There are times when the only person, other than myself, who feels the need to grab some nutrition after hockey is Milhouse. Ah yes, ever-so-dependable or maybe he is just constantly hungry? Well whatever the case, this was the situation as we had just finished up hockey and no one else wanted food. Aren't they hungry??? So we decided to hit up The Ramenman, just to find out they were closed for renos (they are open now). So we did the next best thing and grabbed some Vietnamese at Pho Goodness. 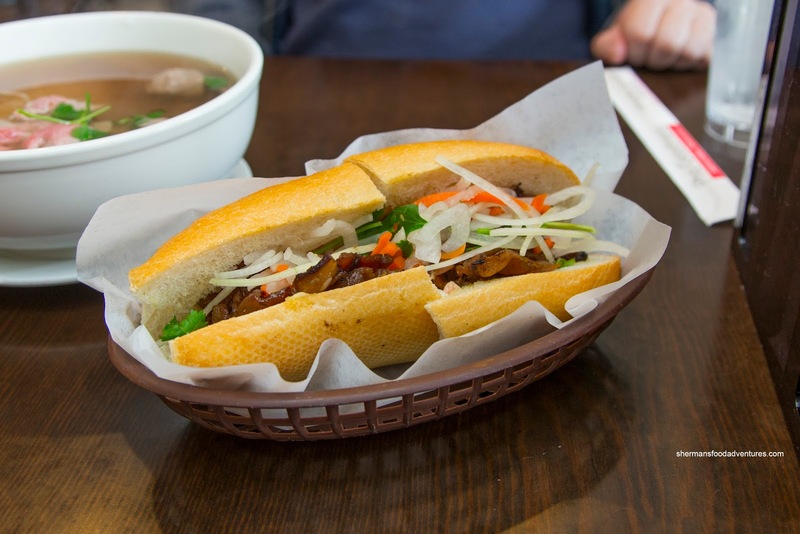 We shared the Grilled Pork Banh Mi to start and even before taking one bite, we knew the bread would be subpar. It ate every bit as chewy and stiff as it appeared. In fact, the texture of the bread overshadowed the nicely charred pork. The fatty slices were well-marinated being sweet with some saltiness. 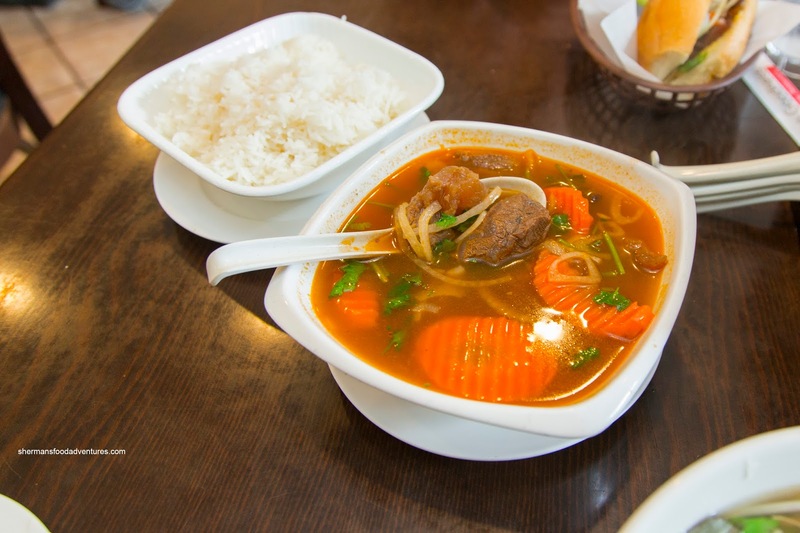 For his main, Milhouse had the Bo Kho with rice. Again, the visuals didn't instill a lot of confidence as colour was very light and lacked depth. Yep, the flavours were indeed weak with only the sweetness of sugar as the dominant seasoning. The chunks of beef shank ranged from tender to downright chewy. 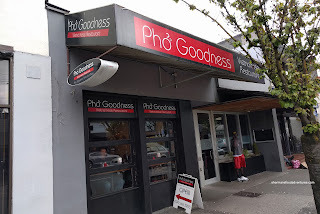 For myself, I had the Pho Dac Biet which was pretty sweet as well. 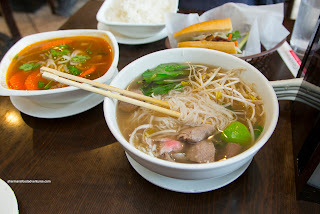 In fact, other than a background star anise flavour, the broth was overly flavourful from the sodium. On a positive note, the meats were plentiful, sliced thin and tender. Noodles were good too in terms of portion and being chewy and not clumpy. I also got the Lemongrass Chicken with rice and this dish was the best of the bunch. It featured 2 large pieces of well-charred dark meat that was super juicy and well-marinated. The rice was dry and chewy. 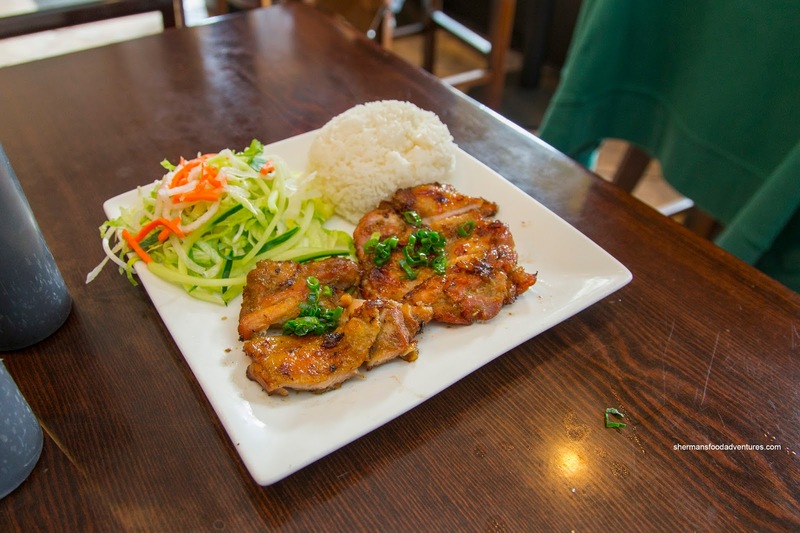 From the 4 dishes we tried, it was a bit hit and miss. Okay considering the location, but then again, there are more and more choices for Vietnamese food in the Downtown core (Pho Central only a few stores down). Love this place. Cheap and cheerful. Been here a few times and I need to do my review!